Chenopodium album is an annual, C3 herb (Jacobs 2001), erect, about 1m (occasionally to 2.5 m), branched, stem angular pale green, ridged with reddish or pale stripes. 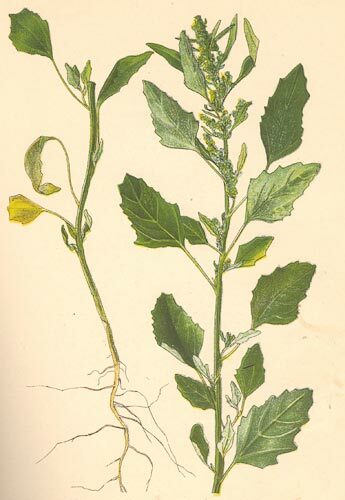 Chenopodium album plant (painting) .agroatlas.ru.jpg (Accessed 12/2014). Leaves alternate, stalked, blade 3-10 cm long, to 8 cm wide, egg- to diamond-shaped, upper leaves often lance-shaped, tip pointed to blunt, base broadly, shallowly wedge-shaped, major veins 3, palmate at base, margin irregularly, lobed and toothed, teeth blunt or sharp tipped, surface dull dark green with white, mealy bloom, especially below. Flowers green-white mealy, tiny, calyx white-mealy, 5-parted, lobes keeled, no petals, in dense clusters along axillary and terminal spikes; wind pollinated and self-fertile (autogamous), (Mulligan and Kevan 1973), June-Oct.; leaves and persistent calyx reddish late in season, appearing star-shaped (use lens). Chenopodium album fruit and seeds. Leo Michels.luirig.altervista.org (Accessed 12/2014). 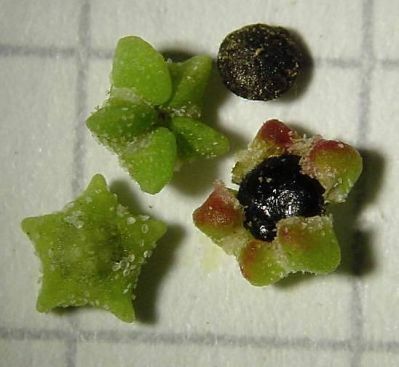 Fruit dry, 1-seeded, seed about 0.1 cm, shiny black, an average plant can produce 72,450 seeds. Seeds eaten by many birds and small mammals, germination is reportedly enhanced by passing through birds. Seeds dormant in autumn, when first mature germinate in late spring until late summer on open soil (Keever 1979). Seeds can survive in soil up to 20 years (Bassett and Crompton 1978). Habitat: Open or part shaded sites, agricultural weed of disturbed upland areas, vacant lots, fill, prefers calcareous soils. Notes: Introduced as an edible and medicinal plant. 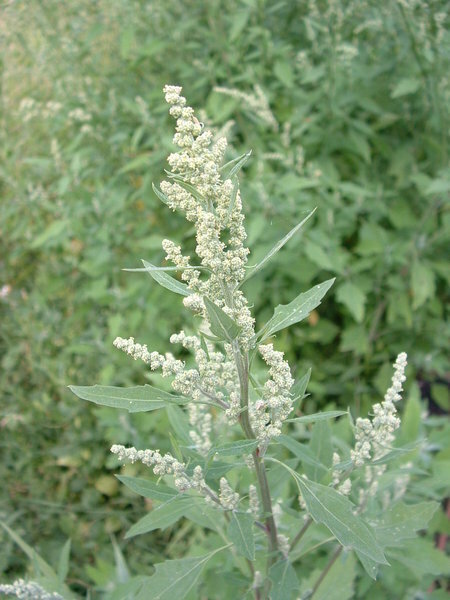 Young leaves and shoots edible if cooked as are flowers and seeds. However, plants take up pesticides and nitrates that can make them toxic (Schwartz 2000; Yatskievych 2006). Leaves also yield Ascaridole used as a treatment for round and hook worm infections (Bassett and Crompton 1978). Leaf surface waxes contain numerous aldehydes and acetates. Young plants killed by cutting or trampling. Lamb’s-quarters are attacked by numerous insects including various thrips, and aphids and Lepidoptera. It is also associated with numerous fungi and viruses including several that are pests of agricultural crops. (Bassett and Crompton 1978).